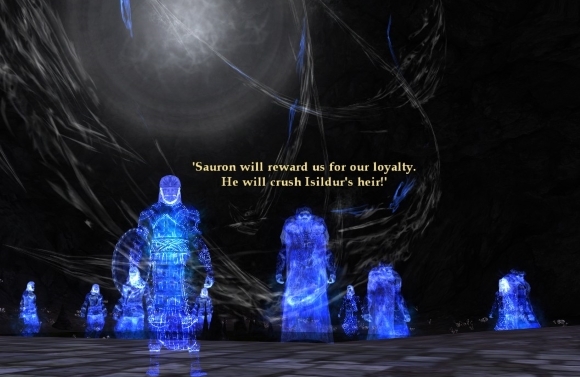 There’s an (inconsequential) choice at the end of one of the new epic story side missions where you — as one of the cursed spirits where you get to choose whether to go with Aragorn to be redeemed as part of his ghost army or to swear eternal allegiance to Sauron. So of COURSE I had to go with the latter, just to see what happened. It was a little bit of a letdown during the closing scene, but I appreciated the choice nonetheless. War-steeds? Bah. I’m all about the goats in Gondor, baby! This was right as the sun was starting to come up, and I thought that the shade of the sky contrasted so nicely with the bonfires of the beacon here. Gondor on the sea. 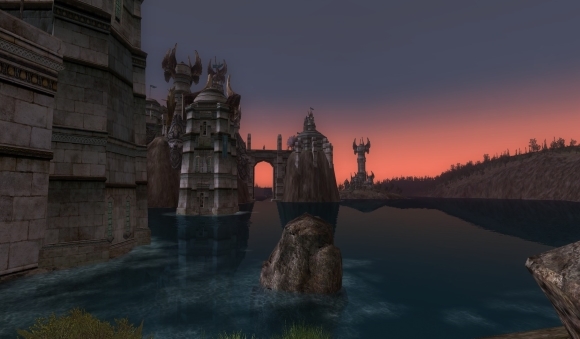 Is this the first time that we’ve seen the ocean proper in LOTRO? I guess Forochel’s Ice Bay leads out to one, but I can’t think of anywhere else. 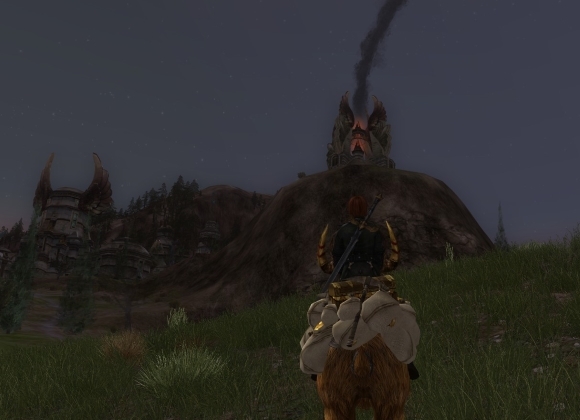 Gondor architecture is a little blocky and swan-y for my tastes, but it’s still impressive in scope. 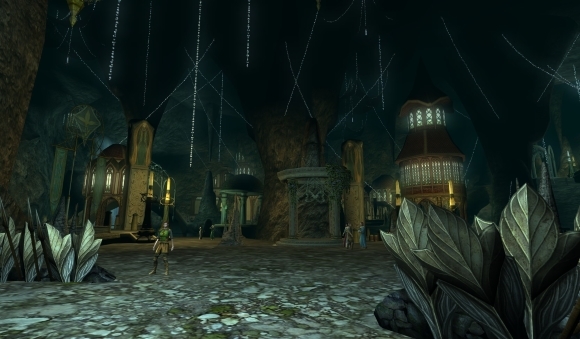 There’s an elf cave in Gondor? There’s an elf cave in Gondor. I’m having a hard time wrapping my head around elves voluntarily living underground, especially bumping into them after so long since seeing them. Mirkwood? I guess Mirkwood. I wasn’t weeping in joy to be reunited with them, but it is kind of nice to see a race other than Man for once. It’s the show that Syl’s been dreading for almost eight episodes now: The Secret World! Between conspiracies, zombies, ancient myths, and present-day cabals, is there actually music in this game — and is it any good? The bards investigate in this creepy, kooky, mysterious, and ooky show! Listen to episode 32 now! Are you an entitled player? If nothing else, my ArcheAge post from last week showed that there are definitely passionate feelings on both sides of the pro-PvE server/anti-PvE server discussion. Not being as intimately familiar with the game as some folks, I learned a bit about the makeup of the game and how, indeed, a PvE server might not be feasible even if Trion wanted it to be. But my wish remains: that I’d love to experience this particular sandbox MMO — as it looks pretty nifty in so many areas — but not in a PvP setting. Anyway, one of the comments on that post used (and then retracted) the word “entitlement,” which is a label that seems to be applied often and liberally these days in (but certainly not exclusive to) the MMO scene. The misapplication of entitlement bugs me a bit because it feels like a cheap shot to shut someone down who disagrees with you on a way that an MMO should be run/structured/added on to. Kind of like how we over-plaster “hipster” on folks and trends that we don’t like, whether or not they’re actually connected to the hipster movement. The word “entitlement” has so many negative connotations associated with it that getting slapped with it is going to stink up your reputation something fierce. And I have no doubt that some gamers act as if they’re entitled to everything, at the center of their own narcissistic universe… but that doesn’t mean that everyone’s like this, even if they want something about an MMO to change. Entitlement means that you have a right to something by virtue of who you are or what you have done. I paid the cashier at McDonald’s a dollar, I am entitled to a sodium-laden cheeseburger. Another definition — and this is the one that’s probably used in MMO arguments — is “the feeling or belief that you deserve to be given something (such as special privileges).” The word “arrogant” should probably be attached to “entitlement” here in many instances. 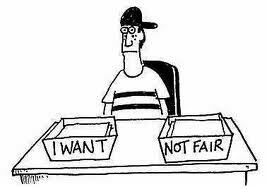 In larger society, entitlement is seen as people demanding things now just because they want them so very badly, but not as a result of any time, effort, money, or resources spent to earn or deserve them. So the following is how I see what entitlement is and is not when it comes to being part of the MMO community — and please let me know if this jives with how you see it or if I’m off-base here. I’m geniunely curious. Entitlement is when you feel a game should change for you personally. Entitlement is not when you have a desire to see a game change in some way, but stop short of demanding (or throwing a tantrum) over it. You are entitled when you see game development as something that services you first and foremost. You are not entitled when you understand that you are part of a community and can fathom why devs will be making features that are (in their eyes) for the best of the game and the larger community even if they’re not up your alley. If I pay for a game service, I am entitled to what the studio has promised for that payment (access to the game, delivery of an item purchased, etc.). If I’m playing but not paying, then my claim on even those factors is skimpy at best. I’m entitled to get whatever’s coming to me within the established rules of the game for the actions that I take. I have no grounds for entitlement when I want advancement/virtual goods in exchange for no effort on my part, just because I see others — who have earned them — possessing them and I want a slice of cake too. Since I’m agreeing to a studio’s EULA when I play its game, my “rights” are pretty much subject to whatever the studio has laid out in that electronic contract. I may feel that I am entitled to be treated a certain way in the game, but what’s really motivating the studio to do anything is to avoid bad publicity and keep as many consumers using its product as possible. It doesn’t HAVE to do anything it doesn’t want to unless there is an actual law that touches on some aspect of the service (a studio cannot use my account information for fraud, for example). My general feeling of where the line lays with entitlement is whether or not you believe that a studio has to do something because you want it to. I’ve yet to meet a person who is completely OK with everything an MMO has and does, and does not want to see anything changed, added, or taken away — but that is not necessarily entitlement. 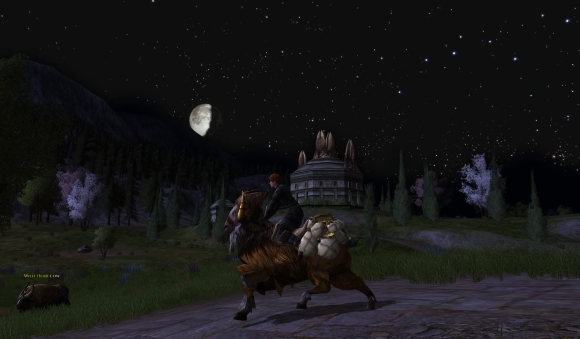 We all have opinions, desires, and wish lists, and part of the fun of being an MMO player is sharing those and discussing them. It’s when people become self-deluded, perhaps through a feedback loop of reading other forum posts confirming their desire, is when there’s a danger of moving over into arrogant entitlement. It’s no longer a wish or something one lobbies for (on, say, a blog); it becomes a bold declaration that this HAS to happen, and how DARE the devs not make it so right away. The “or else” is implied and is about as empty a threat as can be. Or else what, you’ll just whinge some more? Stop playing? Create a (snort) internet petition? However, the problem with carelessly slinging around “entitlement” is that it eventually makes a hypocrite of us all. Sooner or later your expressed desire for change or a feature could get you labeled as entitled by someone who disagrees with you. I’m not short on opinions, but there’s a difference between expressing those and demanding them. I may not agree with the actions of a studio, I may not play a game or may leave because of those actions, and I may express disapproval with what happened, but I’m hopefully grown up enough to accept it, be happy for those who are getting what they desire, and eventually move on. We’ve finally made it to the penultimate deck of the Von Braun, command. SHODAN pops on the comm to tell me that we might as well give up on this ship, as it’s a lost cause, but before we blow it up we have to transfer everything over to the Rickenbacker. Wait a second, the Von Braun is the only ship with a FTL drive. Why are we giving up on it again? Right off the elevator, I trigger a security camera that sends out an alarm. If you don’t get these cameras quick enough, the game goes into a two-minute security alert while mobs bum rush you and the klaxon goes off. It’s very nerve-wracking, so I usually find a hidey-hole and hope that I can live to see another day. Happily, the inventive level design hasn’t ceased — the command deck has a tram system! Ooh, I love trams and trains and all assorted public transportation goodness. While I take a ride to the first stop, the Many tell me (how?) that they’re looking forward to getting to Earth and wiping it clean of us free-thinkers. Me and SHODAN are the thin cyber line between the homeworld and this threat. That’s not a comforting thought. As I make my way through operations, I spot the last two humans on the Von Braun fleeing from one of the big muscley dudes. Naturally, I’m behind a force field and can’t help or join them, so it’s just like the last dozen or so times that I’ve encountered NPCs. 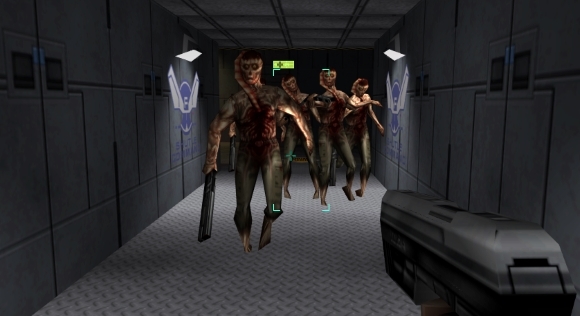 One of System Shock 2’s limitations is the fact that all of the men share the same look and the women share the same look (with one exception in the latter case). It’s not terribly noticeable since most everyone’s dead, but once you do spot it, it becomes hard to ignore that you’re on a ship of clones. Since my character is incapable of shouting, “Hey, wait up guys!” the escape pod takes off and I’m left behind. Again. So alone, forever alone. It seems like a bit of a jerk move on their part, since they’ve obviously seen me at least once. I guess I would be a third wheel. I turn around and fiddle with the trash on the ground, finding yet another pack of cigarettes. 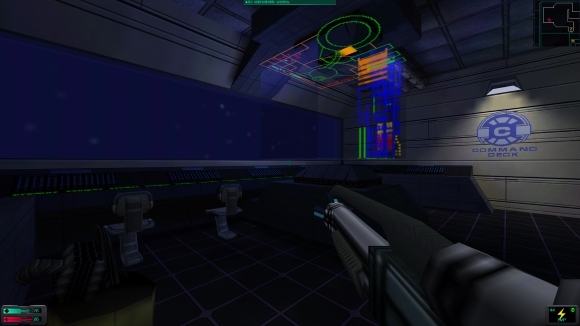 One thing that System Shock 2 has taught me is that even in the future, even in deep space, even on a high-tech vessel, there will still be people sucking on cancer sticks. With the last escape pod gone (why would I want to go to Tau Ceti V anyway? 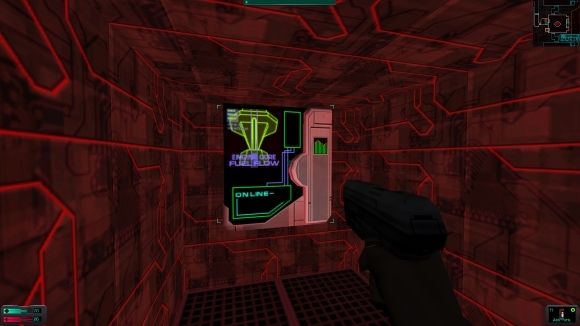 ), I resign myself to doing SHODAN’s bidding once more. This involves getting to the bridge and helping to regain full control of the ship from Xerxes so that SHODAN can blow it the heck up. Hey, I just work here, I don’t make policy. 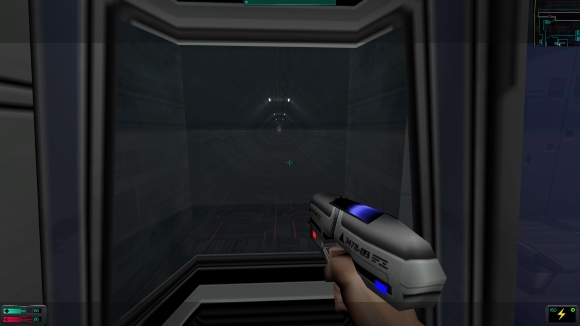 This is where the game gets extremely annoying, because in order to “beat” the command level, you have to return to previous levels (such as operations and engineering) to accomplish various tasks. It’s a lot of needless backtracking to fiddle with buttons and then coming all of the way back to the bridge anyway. There’s also a side mission in which I have to blow up some shuttles to stop the Many from escaping the ship before it can be destroyed. I can’t help but think that I’m also getting rid of my own escape route, but I’m then distracted by the wall decals misspelling “shutle” all over the place. This was a fun fight. I was heading back after blowing up the shutTles when a whole pack of hybrids came at me through the corridor. That involved a lot of backpedaling while I switched to my assault rifle and went to town on them. Well, even after gaining full control of the ship, SHODAN says that the Many are “one step ahead” as usual and the self-destruct isn’t an option. I’m going to have to go to the Rickenbacker (as if there was any doubt about that anyway), but before that happens I have to take care of the capain of the Von Braun. The captain has mutated into a floating brain thing, which so reminds me of Mother Brain. It has this regenerating psychic projection that attacks from elsewhere, so you have to find the brain and kill it in order to shut the whole thing down. How’s life as a floating brain working out for you? Kind of hard to hold weapons, I would think. With everything wrapped up on the Von Braun, I take the umbilical to the Rickenbacker and prepare to see what fresh hell this second ship has in store for me. Today my ultimate life goal is complete: I now own a squirg hat that owns me. It reads my mind and talks to me. I think I’ll never take it off. 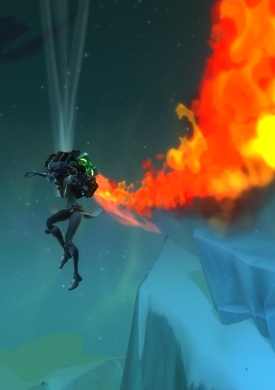 Last night I… flame-jet dropped? Pyro-dropped? I don’t know what the term is for “jumping out of an aircraft with a jetpack to slow your fall” is in the game, but that’s what I did. The Exile spy organization was sending me to infiltrate an ICI (the Dominion spy group) complex, and since I’m a one-zombie army, why not? That’s when I came up against probably one of my most challenging nights in the game. I was going about questing in the ICI cave in Whitevale when I died. I wasn’t paying full attention, so I buffed up and came back for another go. Four deaths in rapid succession later, and I knew I had a problem. The cave had a pretty tight and high mob density with some tough guys that could spew out rather large telegraphs. With little room to jump around, I was getting pwned something fierce. Extra mobs got pulled, telegraphs took me from 85% health to 0% within seconds, that sort of thing. While my guild offered to come in and helped — they knew the cave and were sympathetic — I took it as a challenge to my current build. How I was attacking and what skills I was using in what order wasn’t working, so I started to experiment. I finally have access to a couple of tier 4 abilities, so I studied those and figured out which ones would allow me to unleash as much up-front DPS as possible. I didn’t want to mix in too many healing skills, since every one I chose means a DPS ability taken out of the rotation, but I had to keep a couple. That stupid cave took me far longer than it should’ve, but by the time I was done I emerged with a much more effective build that kept my health up while killing far more rapidly than before. I appreciated the lesson, intended or not, because the game presented a challenge and then supplied me with an array of tools to overcome that obstacle. It was up to me to figure out how to do that most effectively, and by trial and error, I eventually did. Reminded me of more than a couple of instances in The Secret World where the same sort of thing happened. The combat system of WildStar wasn’t my most anticipated feature going into the game, but it’s quickly becoming one of my favorites. It has a great feel and responsiveness to it, and it allows for a lot of user choice when it comes to the style of fighting.